I've been in Austin almost 16 years (! ), and Paggi House has been around as far back as I can remember. Turns out, it's a historic landmark, going back to the 1840s. I know it's gone through some ownership & chef changes in the years I've been here, but I had never managed to get there until now. And I am sorry I waited this long! It was a really good meal with stellar service. Arriving about 5:30 pm on a Monday, my friend and I were immediately greeted by a trio of stylishly dressed women at the hostess stand. We were seated in the main house for dining, and I was struck by the modern decor, yet it still retained a historic touch to it. There is ample outdoor seating in front, creating a lounge-like area, and then through the entrance to the house and immediately out the opposite door is access to the expansive closed-in porch, anchored by the large rock-walled bar in the middle. The bar area has a separate snack menu, which I will have to try on my next trip. We ordered a bottle of red wine, and the waiter came back to the table to say they were out, but offered two suggestions for the same price point. The wine arrived, and my friend, much more of a wine expert than I, felt it was too warm, and our waiter happily chilled it down just a bit. He did mention that wherever it is that this bottle was stored does tend to get warm. Understandable, as our summertime temperatures keep creeping upwards; he was more than willing to accommodate us. 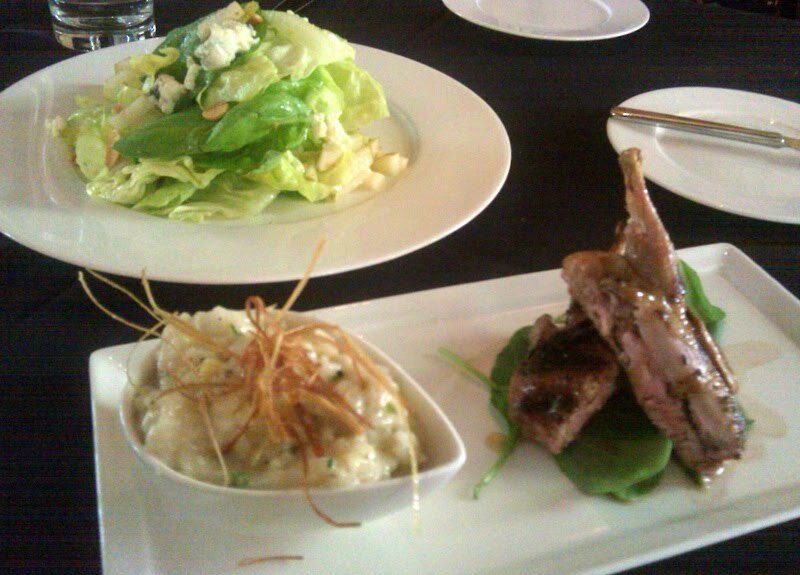 First up was the Bella Verdi Butter Lettuce Leaf Salad and the Lockhart Grilled Quail, always nice to see locally sourced items. The salad was with Asian pear, Maytag blue (Pure Luck's Hopelessly Blue would be lovely! ), & lemon vanilla vinaigrette; all the flavors were really fantastic, but there was very little blue cheese on the salad at all; I had to hunt for some.... though looking now at the picture, I think my friend got the whole blob of blue that's on top! The quail was grilled with an agave glaze, and accompanied by a very subtle truffle risotto with extremely thin crispy fried leeks on top. The kitchen had already split the quail in half for us, and there's really no good way to eat quail in my mind, except for picking it up with your fingers, which is what I did! I could have easily eaten three more quail, and I appreciated that the truffle in the risotto was kept on the more minimum side, though true truffle lovers might be a touch disappointed. At the waiter's suggestion, we had the salad & quail together, and then the Hudson Valley Foie Gras was brought as a separate course. The sweetness from the apple slaw and tartness from the balsamic drizzle balanced the fat quite well. Overall it was tasty, though I generally like my foie a little firmer. 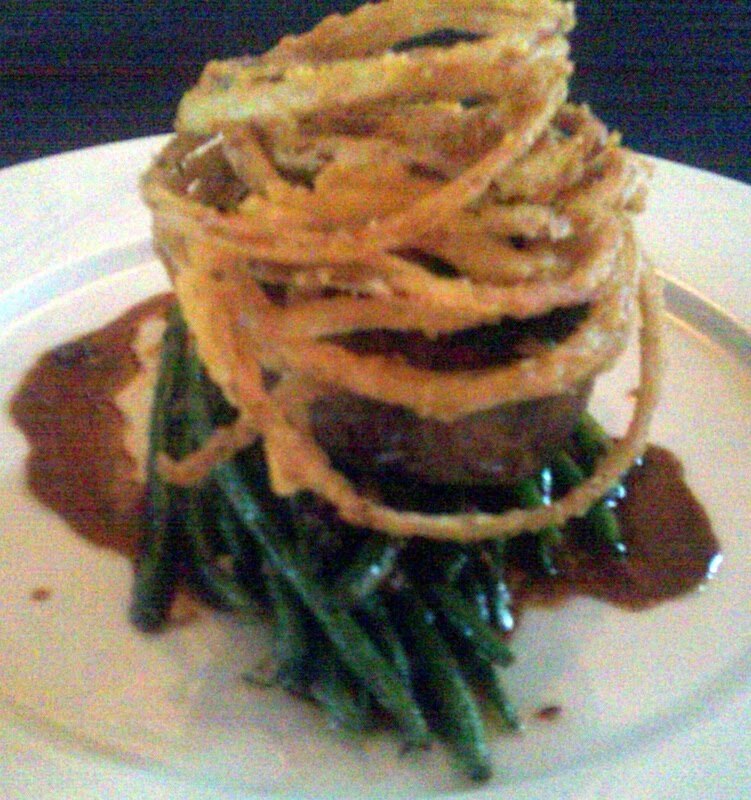 For the main courses, we went with the Sweet Tea Brined Duck Breast and the Mesquite Grilled Beef Tenderloin. I started with the duck, and really liked the crispiness of the skin and the foie gras jus it was in. 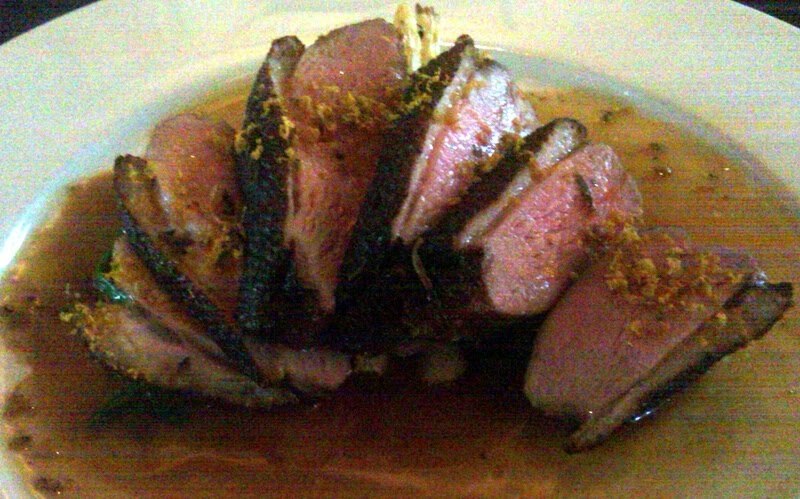 I don't really recall the flavor of the orange gremolata on the duck, but it was there. Then we switched plates, and I got to try the beef, cooked to a gorgeous medium rare. It was a great piece of beef, and the green beans and tiny, crispy onion rings were delicious separately and all together as one bite. 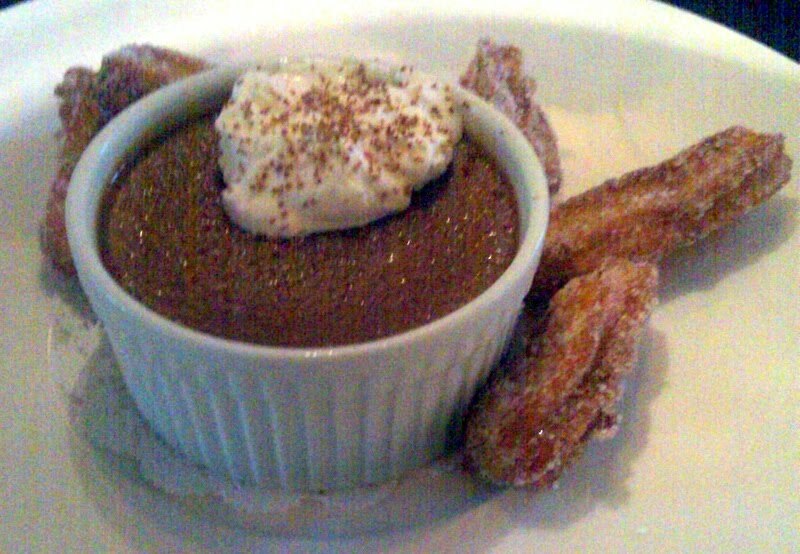 Saving a touch of room for dessert, we ordered the freshly made churros and chocolate pot de creme. The churros were better than the ones I had in Spain, as they were light and not greasy. The pot de creme had good flavor, but a grainy texture that isn't quite right for a custardy dessert like that. And grainy would also describe my pictures :( I've tried experimenting with my camera phone and a small little flashlight, but looking at the quality of these really really makes me realize I just need to carry my point and shoot digital camera with me when I am eating out. My pictures at Paggi in no way do the food justice. For a Monday night in the middle of summer, Paggi House seemed to be doing quite well for themselves. There seemed to be a mix of people at the bar, and a large group dining in the room next to us. Doesn't seem to have that "trendy cool vibe" that a lot of spots downtown have (which I avoid), but a genuine commitment to good food and good service. I enjoyed reading your very descriptive posts. You know your food and you enlighten us with your critiques. My compliments to this fine blog!